When I first looked at Vue vs React, I chose VueJS. One of the reasons was that I felt like Vue was a better choice was the complexity of React classes and life-cycle events. I felt like that was a lot of extra complication that would help with developing frameworks, but preferred the simplicity of Vue’s HTML-like templates and Angular-like two-way data-bindings. While working more with React, I’ve found that can be much simpler, because I can stick to small, pure functions for most of my components. One thing I love about React is how easy it is to test and refactor when you follow the single responsibility of concerns principle. This series of post is on a meta-level about avoiding coupling and cohesion when writing code. I’m using React components as a practical example, so you learn React. My friend Carl wrote a really great post about how cohesion and strong coupling happen in WordPress PHP projects and beyond. Yes, end to end testing with a headless browser may be useful, though I do not use it. But my point is that relying on what the browser looks like is not only a poor test. Using tests instead of the browser forces a pattern of development that I find to be faster and more maintainable. By developing in this fashion, I have increased my output of code significantly and I have a lot more confidence in what I am writing. Also, knowing that I have to live with this code long-term, it’s important to me to have Coveralls and Code Climate in place to enforce these standards and measure improvement over time. This is Prototypal Inheritance, which is different from how we extend classes, via classical inheritance, in PHP by overriding methods. I’m not arguing that you should never extend React.Component, its useful, but I always default to small, functional components. Why? They are pure functions — arguments go in, output comes out, no side effects. Pure functions are easy to test. They do not have side effects by default, which is a condition for true unit testing. Let’s refactor to a pure function that is testable. We need to modify an array of posts. By injecting that array into the function, we go from modifying an array of posts to modifying the passed array of post. I just applied the principle of dependency injection so that the function can be isolated. In software engineering, dependency injection is a technique whereby one object (or static method) supplies the dependencies of another object. A dependency is an object that can be used (a service). An injection is the passing of a dependency to a dependent object (a client) that would use it. One key benefit of dependency injection is that we can inject mock data when testing. Instead of mocking a global and hoping that’s accurate, we are testing the function exactly the way it actually is used. Yes, we can test class methods as well. I’ll get to that, but it’s more complicated. I’ll get to when that complication is worth it, but let’s look at when its not first. Let’s walk through setting up tests and writing your first tests. As this post goes on, we’ll add more features to the example app, using tests to guide the development. This will allow us to start small, and build complexity one layer at a time, with our tests making sure nothing falls apart in the process. 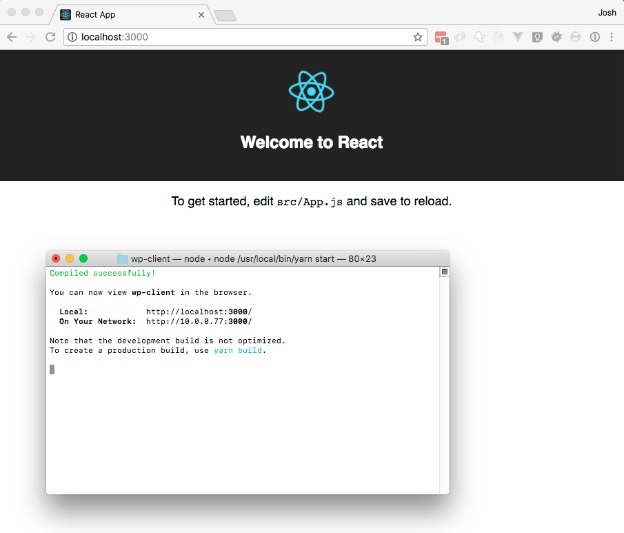 First, let’s create a new React app, with a dev server, and everything we need to run tests. Coming from a WordPress background, that sounds hard, but like a developer-friendly framework should, this is easy with React. Seriously, its three commands if you have Node, npm and yarn installed. Once that’s complete, your terminal should show you the URL for your local dev server. Here is a screenshot of my terminal and browser with the default app. That’s one test, which basically covers if mounting the app causes an error or not. That’s a good catch all acceptance test, but not the kind of isolated unit test we want and running it shows us if we have tests running or not. Jest has a pretty simple API. Let’s look at one test suite, with one test, before jumping into something more practical. Test suites are defined by the function describe. Everything inside of its closure is considered part of one test suite. Organizing tests into test suites makes them easier to read and you can skip a whole suite or add a specific setup or teardown function to the suite. Inside the test, Jest gives us the expected function. We provide expect with the result of the function being tested and then make an assertion. In this case, we’re using the toEqual assertion. We are asserting that the input we expect to equal a value, does equal that value. Since pure functions have one output and no side-effects, this is a simple way to test. That’s the basics of Jest. With Jest, you can run basic tests as I’ve shown in this post. 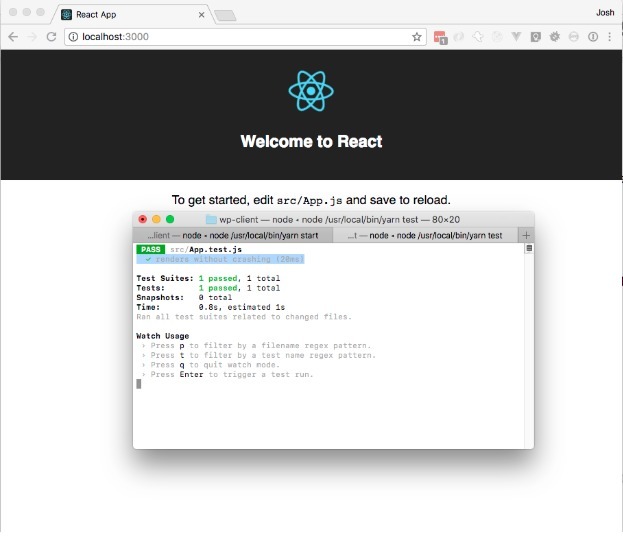 As this series continues, I’ll cover snapshot testing React components with Jest and the React test renderer. For more complex testing, I’ll introduce Enzyme. The post Getting Started With React Unit Testing For WordPress Development appeared first on Torque.